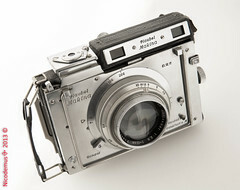 Plaubel is originally a German camera maker, founded in 1902 by Hugo Schrader as a distributor and lens maker. 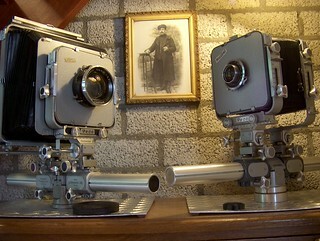 It began the production of cameras in 1910. It became famous for the Makina series of press cameras, introduced as early as 1911 and withdrawn around 1960. 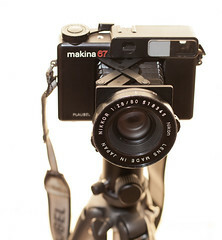 After the war, it also made monorail view cameras, and a 9×9 SLR, the Makiflex. In 1975 it was bought by Kimio Doi (of the Doi company) and effectively became a Japanese company. 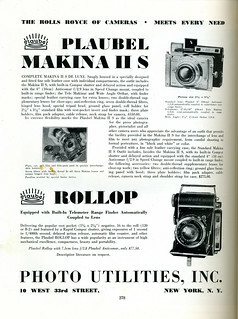 It launched a modernized successor to the Makina, called the Makina 67, in cooperation with Konica, and later with Mamiya. It stopped the production of the Makina 67 in 1986. 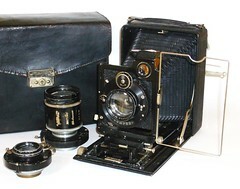 Plaubel continues to produce large format cameras (Peco Profia for 4×5, 5×7, 8×10) but also a 6×9 digital camera (PL69D). With adaptors for 120 film. ↑ Maki 69 monorail ID camera serial no. 167, dated about 1973, with 135 mm f/4.5 Xenar and Prontor Press shutter, sold at the 22nd Westlicht Photographica Auction, on 24 November 2012. This page was last edited on 25 November 2017, at 04:55.